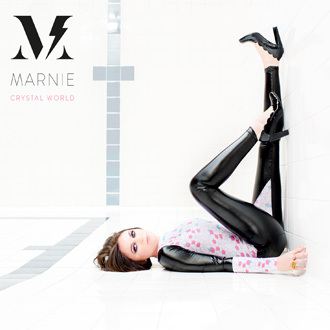 Crystal World is a glacial electronic pop album by Marnie, the moniker adopted by Ladytron lead singer Helen Marnie for her first solo project, produced by Daniel Hunt and co-produced by Bardi Johannsson. Recorded in Reykjavik in August 2012, Crystal World comprises ten original songs written while Ladytron are on hiatus. Like Iceland itself the album evokes the collision of two spheres. "I knew I wanted it to be quite pop and song based," Helen explains. "I also wanted it to be more personal and emotive, which I hope comes across. It's not a dance album. Parts of it are serene and beautiful, others are dark. It's like a landscape that changes over time." Pulsing lead track The Hunter was issued as a single in May 2013, while Hearts On Fire lights a torch for dark anthemic pop. Venturing further into Crystal World, The Wind Breezes On glides atop thunderous organ flows, while Gold inspires feelings of melancholy and hope in equal measure. At nearly eight minutes, Submariner is an epic tale to warm the coldest of hearts, and reflects an enduring love of the sea. "When I think of the sea," says Helen, "I think of my childhood. I spent a lot of time by water, exploring and having fun. One side of my family hails from the east coast of Scotland, so that's the sea I'm generally referring to. I relate to it because it was a big part of my life. Sometimes I feel enclosed by cities, and so the sea is the getaway in my head." "I started out playing classical piano, and was introduced to synthesisers when Ladytron formed. The keyboard is what comes naturally to me, and synthesisers can create a lot of warmth and depth and dirt. They're extremely versatile, but with Crystal World I knew I wanted real piano on some of the tracks. It's quite prevalent on Submariner, and on Gold as well." Cover design by Laura Hussey. Images by Lisa Devine, assisted by Mack Photography. Clear vinyl edition (2018) features additional remixes by Mark Reeder, Roman Nose, and Stephen Morris of New Order. CD is housed in 6 panel digipack. Double album is a limited edition of 500 copies in crystal clear vinyl housed in a gatefold sleeve, with free digital copy (MP3). To order please select correct shipping option and click on Add To Cart button below cover image, or else contact us by email for other payment options. If you would like to order the double vinyl edition complete with a signed postcard from Helen please order using the pay button on the right.